Here is an advertisement by Corning from the May 29, 1948, edition of the Saturday Evening Post. The Hale 200-inch telescope mirror was dedicated for service at Mount Palomar on June 3, 1948, at the in honor of George Ellery Hale. As a side note, it is interesting that in the magazine of the era (which were typically quite large in width and height), actual photographs like this one were rarely used in advertisements. The vast majority of artwork was... artwork - pencil drawings or actual paintings. Tomorrow a new door to the secrets of the universe will be gin to open. A door through which astronomers will be able to see 6,000,000,000,000,000,000,000 miles into space- twice as far as ever before. It is the giant telescope atop Mt. Palomar, so powerful that the canals of Mars, if there are any, will for the first time be photographed. It all began 12 years ago when Corning cast the now-famous 200-inch telescope mirror, the world's largest piece of glass, after most experts said it couldn't be done. 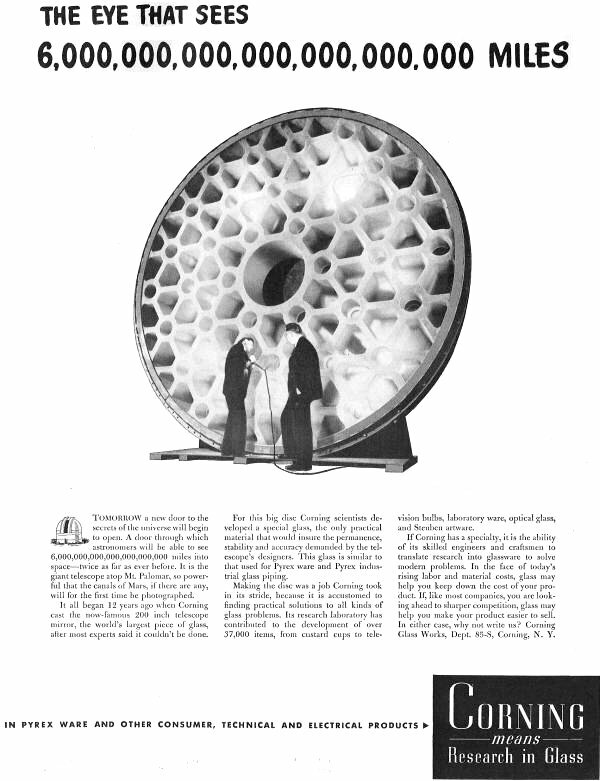 For this big disc, Corning scientists developed a special glass, the only practical material that would ensure the performance, stability and accuracy demanded by the telescope's designers. This glass is similar to that used for Pyrex ware and Pyrex industrial glass piping. Making the disc was a job Corning took in its stride, because it is accustomed to finding practical solutions to all kinds of glass problems. Its research laboratory has contributed to the development of over 37,000 items, from custard cups to television bulbs, laboratory ware, optical glass and Steuben artware. If Corning has a specialty, it is the ability of its skilled engineers and craftsmen to translate research into glassware and solve modern problems. In the face of today's rising labor and material costs, glass may help you keep down the cost of your product. If, like most companies, you are looking ahead to sharper competition, glass may help you make your product easier to sell. In either case, why not write us? Corning Glass Works, Dept. 85-S, Corning, N.Y.